2 Tea spoons per glass Galliano. 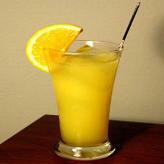 Place 5 ice cubes in a blender, add the Vodka and orange juice and shake well. Strain into a tall glass and add 2 ice cubes. 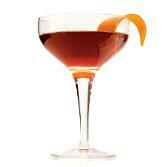 Allow two tea spoons of Galliano floating on top and garnish with an orange slice. Put 6 ice cubes in pub measure container. Add the whiskey and sweet vermoet in container. Stir well and pour slowly in short glass. Put sweet cherry on a toothpick and put that into the glass. 1 Tea spoon of sugar. 1 Tea spoon of rum. Three quarters of glass finely crushed ice. 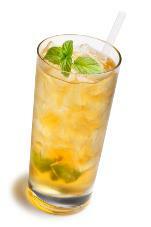 Crush about 9 mint leaves into a glass. Add sugar and water, stir thoroughly until the mint is thoroughly ground and the sugar has dissolved. Remove the mint from it by sifting. Make the glass filled with crushed ice and pour enough whiskey in the glass to fill approximately 25mm from the top. Mix well and put a teaspoon of rum on the surface float. Garnish with 4 sprigs mint leaves. Order it in the glass that the person drinking it nose will disappeared when they take a sip of the Julep. 2 Parts Canadian whiskey or any other which you prefer. Put about 6 ice cubes in mixer and pour the Whiskey, Dubonnet and Triple Sec in. Shake well and pour through a cold short glass with the ice cubes in. 1 Part fresh grapefruit juice. 1 Tea spoon of lemon juice per glass. Place four ice cubes in a drink mixer, add the Vodka, grapefruit juice and lemon juice. Shake well and strain into a cold cocktail glass.